The Best Books Ever: Amanda thinks Positive is a powerful book you should read! Amanda thinks Positive is a powerful book you should read! Wow was this book powerful. I found it almost painful to read at times and wanted to cry for Paige. It is hard to think about the fact that his happened in the 2000s and that this was a REAL story, not a made up one. Paige Rawl is someone I want my children to have as a heroine. She is strong, smart, and has a heart for other people. For someone so young, she has been forced to be wise beyond her years. It was so hard to read everything that happened to her. As a teacher, I was horrified by the way Paige was treated- the names, the bullying, it was unbelievable. The way Paige moved from a place of darkness to a place of healing is something that teens will relate to and be engaged with. I would go so far as to make this book required reading for every high school class. 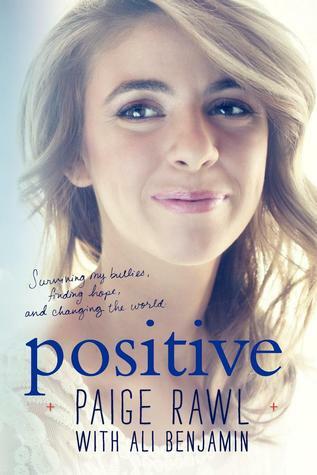 This a powerful book and Paige is someone who is a powerful voice for teens who are born with any sort of difference.